When you encounter BSOD, it often tells you about the problematic drivers. The volsnap.sys is one of the drivers on Windows. It often causes stop error on your PC. 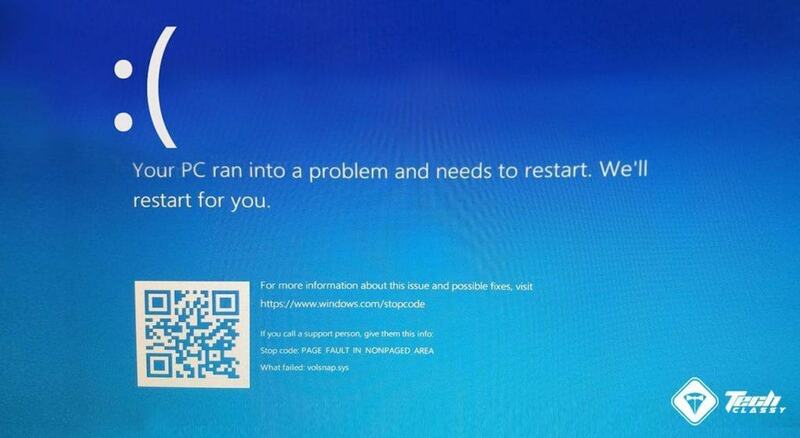 This article explains how to fix volsnap.sys failed blue screen of death. Usually, Users may encounter various stop errors like page fault in nonpaged area. The driver name volsnap.sys may appear along with the BSOD name. Again, You may find it by analyzing the memory dump. That driver is related to a service Volume Shadow Copy Service or VSS. There might be some reasons like the memory issue, hard disk problem or system file corruption behind the BSOD. But, You always can resolve it. If you already have been encountering this problem, you are in the right place. To resolve volsnap.sys BSOD, you can follow these methods. Before that, Update Windows to the latest version. Because, Sometimes, Updating may save your day by fixing problems like blue screen errors. Sometimes, The blue screen of death occurs due to the external devices connected with your PC. The volsnap.sys BSOD is no different. If there is an issue between external flash drives like SSD, Pen Drive or Memory card etc, this problem may appear. You also should disconnect other external devices. Then, Restart your computer to see if it fixes the problem. You always should keep the drivers up to date. Because the outdated drivers cause various problems including BSOD on windows. Again, Sometimes, You may encounter a problem right after updating any specific drivers. So, To fix volsnap.sys failed error, you may need to update or roll-back drivers depending on the situation. To do it, follow these instructions. At first, Open the Windows Device Manager. To open it, you can type devmgmt.msc and press enter. Now, Expand IDE ATA/ATAPI controllers and right-click on the driver something like Intel(R) 300 Series Chipset Family SATA AHCI Controller. Then, Choose Update Driver and select your preferred method to do it. Also, Expand Storage Controllers and update the drivers like Microsoft Storage Spaces Controller and Standard NVM Express Controller etc. If you want to roll back, follow these instructions. You can open device manager, find and double click on the drivers you want to roll back. It will open the properties. Then, Go to Driver tab and click on Roll Back Driver. Updating and roll backing manually may be a bit complex. Again, Sometimes, Roll Back button may just be grayed out. So, You could use Driver Booster, Ashampoo driver updater etc. from the beginning. These software can help you in many ways by updating, backuping, restoring drivers automatically. Anyway, Doing the above things may fix volsnap.sys blue screen error. If not, follow the next methods. Restarting the Volume Shadow Copy Service in short VSS may work sometimes. If you find this service is not active, you probably should not touch it. Or you can just start and stop it again. It is one of the most working methods to troubleshoot volsnap.sys failed blue screen error. Here are the full instructions. At first, Open the start menu, type cmd, right-click on the command prompt and choose run as administrator. Now, Run the following commands. If you see it is not active, leave it as usual. Or you can just start and stop it. If it is active, restarting may solve your problem. So, To stop this service, use this command. Now, See if tweaking VSS has fixed your problem or not. It can be another solution to get rid of this problem. The system file checker in short SFC tool can help to detect and repair corrupted system files. Anyway, To run SFC, follow these steps. At first, Open the command prompt as administrator like before. Then, Run the following command. Now, Wait until it finishes the process. It may help to fix volsnap.sys failed BSOD. The problem may be due to hard disk bad sectors. So, You might want to repair it. The chkdsk command can fix basic disk related issues. So, It has chance to fix the blue screen of death too. Anyway, To run the command, follow these instructions. First of all, Open the command prompt with admin rights like before. Then, Type the following command and press enter. Note: C: is for local disk C. You can replace it with D for local disk D. By this way, You can run this command for other disk drives too. By the way, It may ask for permission to restart Windows. In this case, Just press Y and hit enter. During next startup, Windows will check for the basic disk problems and fix it automatically. Some antivirus programs tend to create this type of problems. In past, we saw Antivirus programs like Trend Micro, Avast users encountered BSOD related to the volsnap.sys. So, You can uninstall your antivirus, firewall or any security programs installed on windows 10 temporarily. Then, See if it solves the main problem. These are the most working methods to troubleshoot volsnap.sys related blue screen of death. If you know any other ways, you can include it in the comment box.